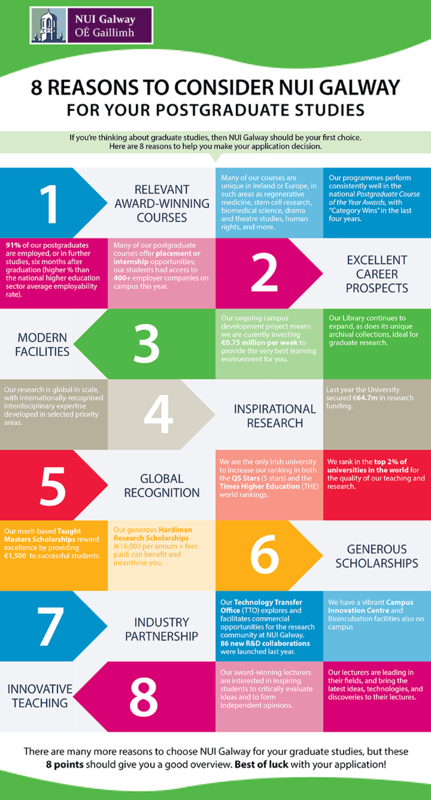 Choose NUI Galway for postgraduate study and you will gain far more than just a qualification. NUI Galway is ranked among the top 200 most international universities in the world, and is one of Ireland’s top universities for graduate employability, with over 91% (average, over last five years) of postgraduates employed or in further study within six months of graduation. We are ranked in the top 250 universities in the world (Source: QS University Rankings, 2015). Our courses are developed based on industry needs, and our cutting-edge research feeds into these courses, setting you apart in the jobs market. Our learning environment is close-knit and supportive, and our teaching facilities on campus are world-class, the result of a €400 million capital investment programme. You will live and learn in a vibrant and exciting city located at the edge of Europe, where creativity and innovation thrive. Our taught & research courses prepare you for a rewarding career, provide you with practical learning opportunities, and upskill you for a constantly evolving workplace. Get the competitive edge with a graduate qualification from NUI Galway. Watch our video for a sense of postgrad life here, and view featured content from it: links below. A postgrad qualification is recognised as a way to boost your career. Our graduate employability rate is consistently higher than the national average. See what our postgraduates have to say about our unique programmes, funding and career opportunities, conversion courses, and more. At NUI Galway you will be provided with the best real-life learning opportunities to enhance your career prospects for today’s competitive workplace. Galway, on the edge of Europe, is one of its fastest-growing cities. Medieval, yet modern, our university city is steeped in culture & heritage. Scenic, vibrant, special.